Growlers are great, don't get us wrong. At most of our locations, we will fill one for you if you bring it in. But here's the thing: we prefer the Crowler, and you deserve to know why. First of all: what's a Crowler? 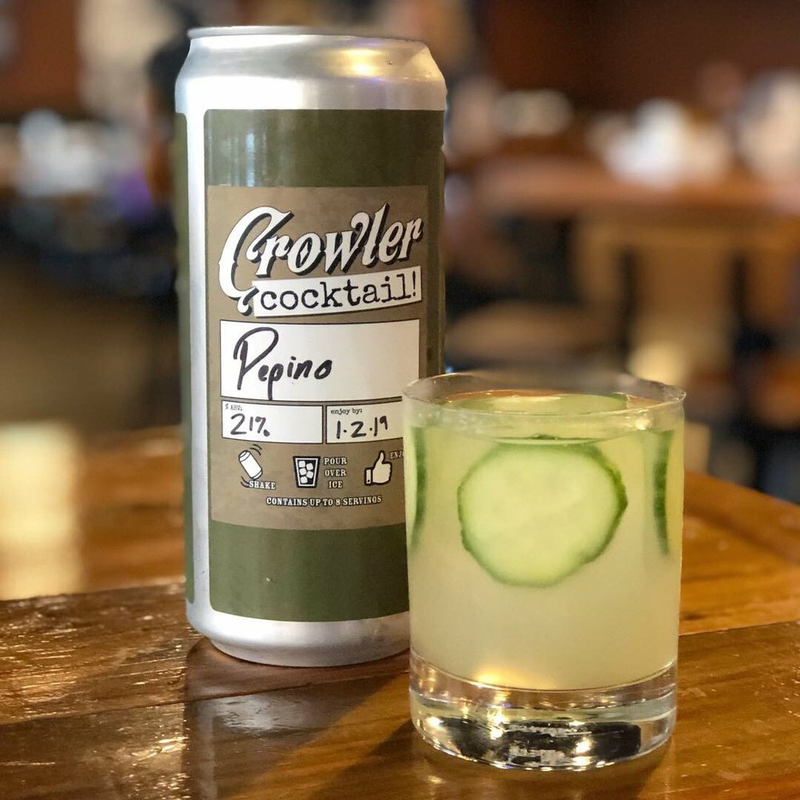 A Crowler is a 32 oz. can, filled to order with fresh beer from the tap, and then sealed tight for maximum freshness and flavor. A Growler is your more traditional form of fresh beer to-go. It's also filled in a brewery or taphouse with draft beer, and sealed to preserve freshness. Traditionally, it weighs in at 64 ounces of brew--not including that heavy, beautiful, breakable glass jug that the precious beer is contained in. Now that we've got the definitions out of the way, let's start with the pros and cons. Whether your beer of choice has been canned or bottled, once you open that bad boy up, you'd better be determined to finish it. There's no way to properly reseal a Growler or Crowler for freshness. That considered, I don't know about you, but I'm much more confident in my ability to finish 32 ounces of say, some rare bourbon barrel aged ale, than a whole gallon. Sure, sharing is caring. But sometimes that's the last thing you want to do with your precious hand selected brew! And for those times, it sure is a waste to know that last pint or two will be flat and ruined tomorrow, primed for the drain no matter how tightly you screwed that cap back on. Not only are we craft beer geeks concerned with how long that beer will stay fresh after it's opened, the shelf life of that freshly sealed brew-transporter is of utmost importance too! What if you decide to travel with your beer--you know, bring it home to meet the parents? Or save it for a special occasion? First of all, glass has this habit of being, well, see-through--or should I just cut to the chase and call it "UV-ray-through?" Light exposure can start affecting the flavor of your brew in as little as a few hours, and even the dark brown glass most commonly used for Growlers will still not be as effective at protecting your beer as an aluminum can will. The same holds true with fresh beer's other nemesis, oxygen. Any capped Growler will surely allow for some, however minimal, oxygen exposure even before being opened. That's why the typical shelf life for a "growled" beer is a week or less. The Crowler, on the other hand, is sealed tight by a machine that effectively folds & clamps the aluminum lid on top, ensuring no oxygen can go in or get out. Depending on where your beer gets crowled (some of the machines vary in oxygen purging & CO2 infusion capabilities), you've got yourself a fresh brew for anywhere from 2 to 6 weeks! Some will tell you longer, some will tell you shorter--but at The Craft Bar, we feel pretty confident saying 2-3 weeks. We pour it, seal it, sell it, buy it, and drink it...and that's the consensus. The obvious point here is that glass is fragile, and aluminum is not. Not only is glass relatively easily broken, it poses potential health risk and danger once it is! For me, the idea of "to-go" represents freedom, fun, and frolick! Unfortunately, most beaches, parks, and other public areas prohibit glass altogether, thus limiting drinking destination possibilities with a Growler in tote. Alas! One more point for the Crowler, which is perfectly acceptable anywhere that allows the consumption of alcohol! Because glass is reusable (albeit fragile) you pay extra for it. Your first Growler purchase will almost always include a "deposit," which is an investment in the glass jug itself, in addition to the beer you fill it with. Then, for however long you manage to keep it in one piece and properly sanitized, you can continue to fill it for only the price of the beer. Since Crowlers are disposable, you'll never be charged for anything other than 32 oz. of beer** and folks, that's what we like to call "bang for your buck!" **The Craft Bar never charges a deposit/extra fees, but some other places might. We're proud to have our own Crowler machine at 3 of our locations, for your to-go enjoyment! But we don't pretend to be critically acclaimed experts on the science of preserving fresh beer. However, we sure have quite a bit of practice drinking it--and our vote is in for the CROWLER! We'd love for you to share with us on social media! Use the hashtag #crowlerlife and tag @thecraftbarfl to show off your can! ...oh, and no; we are pretty sure cans can't can-can.